Reaching a century of weekly publication of a magazine is no mean feat, and the editors and staff of America should be forgiven if some of the contents of this centennial issue strike the reader as a bit, well, self-congratulatory. We’ve gotten plenty of things right in the past 100 years and written some prescient and perceptive journalism about the church and the world; and maybe those accomplishments have given us something of an ego. There is a surefire cure for pride, however, and it is as simple as a reminder of some of the moments when we got things just a little wrong. Or a lot wrong. An article of recent vintage in America serves as a fine example. It contained a reference to a certain Bishop Blasé Cupich of Rapid City, S.D. We hardly think this fits our good friend Bishop Blase (and we doubt the author does either), but our automated spell-check function apparently does not like Bishop Blase’s attitude, or at least the way he spells his first name. The computer has no problem with such tongue twisters as the name of our friend and contributor Agbonkhianmeghe Emmanuel Orobator, S.J., mind you, but it tricked us into maligning poor Bishop Blase. They stick in the craw, such errors, so much so that one is tempted to ask for relief through the intercession of St. Blase. Er, St. Blaise. See the problem? Even Homer nods, as the ancient copyists of the Iliad used to write in the margins when a text’s grammar or metrics did not scan, and no copy editor in the world can catch everything. That having been said, less forgivable in America’s history have been some of our seemingly judicious edits that were, in retrospect, a little naïve or a lot misinformed. Flannery O’Connor, for example, did not care much for the magazine’s decision to rewrite a paragraph of the essay she submitted in 1957, “The Church and the Fiction Writer,” and history has perhaps vindicated her as a better writer of prose than the clever Jesuit who altered her text (Wise Blood had been published five years before). The editors offered their belated apology in the magazine’s 90th anniversary issue in 1999. America also occasionally perpetuated an absurd stereotype or two, especially during its early years, when women were not allowed to write signed articles and the editorial board was dominated by Jesuits of Hibernian descent. In the very first issue of the magazine, a report on Italian politics announced that “recent elections showed the Italian people are unfitted for the use of the ballot.” Since the sole editor of Italian descent, Dominic Giacobbi, S.J., struggled to read or write English (at least according to his editor in chief), he was presumably unaware that his ethnic heritage had been besmirched. Earlier that summer they were even less sanguine, conceding that “whatever may have been the personal doubts or misgivings of many who questioned this movement, upon the passage of woman suffrage there can remain but one question of practical importance. That is: how can women be taught to use the vote most wisely and effectively?” Other contributors added their own unfortunate misgivings, including the book reviewer Myles Connolly. Connolly, who eight years later published the best-selling novel Mr. Blue, wrote “It is not simply a question of the vote…. It is a question of man doing man’s work, and living man’s life, and woman woman’s… the truth remains that they will never be man’s equal. Aping him, they are inferiors. Cultivating their own natural aptitudes, they can be supreme.” For the record, this is no longer America’s editorial policy. Elitist or not in its editorial outlook, America found one working-class cause in that same decade that it could support without question: the repeal of Prohibition. From the moment the sale, manufacture and transportation of alcohol for consumption officially became illegal in the United States in 1919 until the day the 18th Amendment was repealed in 1933, the editors rarely let a week pass without grumbling about teetotaling Methodists (or, for several paranoid letter writers, teetotaling Masons). Though their argument against Prohibition was usually presented as a case for state’s rights, the sheer indignation they expressed suggests fear of federalism was not their only quibble. “The people who made the Constitution may unmake it if they wish,” declared an editorial in June 1920. As the years passed, what had at first been short editorial asides against Prohibition’s apparent promotion of illegal behavior grew into far-ranging broadsides against the legislation’s scope and effect. Would Mass become illegal in the United States, the editors darkly mused, because of the need to use sacramental wine? (The use of wine for religious purposes was almost universally accepted during Prohibition, truth be told). Would local gendarmes in small-town America use the excuse of enforcing Prohibition as a cover for breaking into private homes without a warrant? Was the British government scheming to pass similar laws in its own territories as one more indignity to be placed upon the luckless Irish nation? And back at home, would lawlessness overtake America’s eastern cities? The national Catholic weekly has also occasionally featured authors whose later antics brought it some embarrassment, including the articles and poetry of a literary editor with a brilliant mind and a talent for comic verse, Leonard Feeney, S.J. Feeney published frequently in America and earned a certain amount of fame for his numerous books, including a book of essays, Fish on Friday. He grew much more famous a few years later for a different reason: his excommunication from the Catholic Church in 1953 for refusing to accept the church’s definition of the dogma extra ecclesiam nulla salus (“there is no salvation outside the church”). Though Feeney was reconciled to the church in 1974 (Avery Dulles, S.J., wrote his obituary for America), his establishment of his own schismatic religious community, the Slaves of the Immaculate Heart of Mary, and his long fight with church authorities overshadowed his literary genius until his death in 1978. 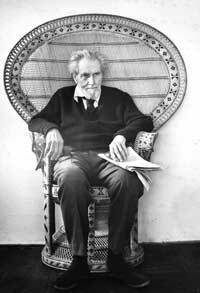 A second contributor whose intellectual evolution made him an embarrassment was Ezra Pound, an American-born writer who came to fame for his poetry but fell into disgrace as an anti-Semite and quisling. Pound would likely have been executed for treason by the United States after World War II had he not been able to convince his doctors that he was mentally unfit to stand trial. In 1940 Pound wrote two somewhat rambling essays on monetary policy for America, the second of which denounced Winston Churchill as “possibly the most phenomenal bungler in British affairs since the ill-starred Island lost the thirteen American Colonies.” Within a year, Pound was delivering the pro-fascist propaganda broadcasts on Italian radio that would later result in his arrest by the United States for treason. The aforementioned list represents a varied cast of characters and themes, and, for the most part, a distinguished though somewhat tarnished catalogue of authors and opinions, if also a regrettable catalogue of errors. But, with 4,852 issues under the belt as of this issue, we were bound to make a few mistakes. And as for those authors and those articles—well, most of them seemed like a good idea at the time. Perhaps the 21st century will offer no such troubles. If my memory serves me right, AMERICA also was highly critical of Mother Mary Joseph Rogers who founded the Maryknoll Sisters and gave a talk to the Catholics at Columbia University saying that she had discovered her vocation at Smith College and that Catholics could serve God on secular campuses. That was too much for the Jesuits! I believe AMERICA apologized...after she died. This article also appeared in print, under the headline "Oops!," in the April 13, 2009 issue. James T. Keane, S.J., an associate editor of America, has never made a factual error in his life.